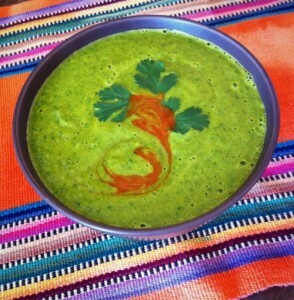 This soup was made with fresh cut cilantro from our garden and the rest of the ingredients were local and organic. It’s a simple recipe that is easy to make and very healthy. It makes a full bowl meal for one or a medium bowl split for two to share. It’s easy to adjust the ingredients for your liking: just add more of whatever you like as you go, or leave out and/or substitute other ingredients to taste. Keep in mind that you do not want to make the soup too hot or overcook the carrots. It is meant to be a mostly raw food soup to retain vital nutrients. This soup would be a satisfying addition to a meal paired with flax seed crackers and guacamole or perhaps a quesadilla. There are so many options (depending on your particular diet). First wash and drain the fresh cilantro. Chop it up and set aside. Slowly combine the water, carrots, and cilantro into a blender or food processor. When all of the cilantro and carrots are finely pureed add the avocado and mix again in the blender or food processor. Pour the warm soup into a bowl, and add sea salt and lemon juice to taste. Mix and serve with fresh chile sauce and garnish with cilantro leaves. Soup will be warm and delicious! 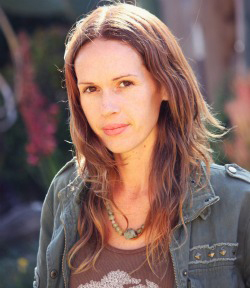 Lauren Luquin is an Artist and Ordained Minister/Practitioner of Metaphysics living in Southern, CA with her husband, 2 children, and their dog. 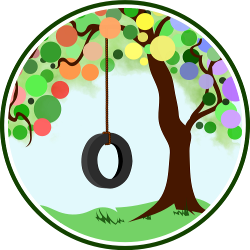 They enjoy unschooling, urban-farming, and natural living. She shares her poetry, stories, and art on her blog at www.laurenluquin.com. Lauren’s creations are for sale in her Etsy shop. You can also connect with her through Facebook, Twitter, or Vimeo. Join Intuitive Heart Sanctuary for Fall Session at www.intuitiveheartsanctuary.com. Yum! This soup sounds so refreshing for a hot summer day…I love fresh herbs…especially cilantro! I can’t wait to try it. Oh wow this sounds so delicious!